This article first appeared in the Australian Chinese medicine Education Research Council Newsletter Volume 4, edition 4. 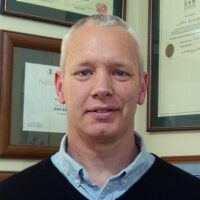 Steve Clavey, the past editor of the newsletter has given us kind permission to make it available from The Acupuncture Clinic website. It was written by Russell Shaw when he was a Chinese medicine first year student at VUT. 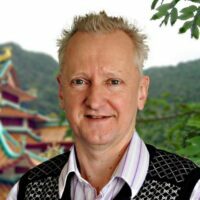 Russell now works as a registered TCM practitioner in East Brighton, Melbourne. He also has a special interest in multiple sclerosis. The San Jiao is commonly described as the functional relationship between various organs that are involved with fluid metabolism. These organs include the Lungs, Spleen, Kidneys, Small Intestine and Urinary Bladder. It is also the fu-pair to the Pericardium which along with the San Jiao is not a distinct organ. The San Jiao Hand Shao Yang meridian runs from the ulna side of the tip of the ring finger up along the dorsal side of the forearm between the radius and the ulna. It continues along the lateral aspect of the upper arm to the shoulder region, from there it runs over the shoulder to the chest region where it branches with one branch descending through the diaphragm, linking successively the upper, middle and lower portions of the body known as the three heaters. The other branch runs up through the neck, connecting to the ear and cheek and terminating at the lateral tip of the eyebrow. The oldest reference to the San Jiao was around 100 to 90 BC, and since that time there have been many interpretations as to exactly what role the San Jiao plays in the functioning of the human body. ” Is the San Jiao system one of the six Yang visceral systems, immaterial, a single organ, three organs, a membrane lining the body cavity, or an abstract division of the Yin visceral systems into three areas of function?” (Sivin, p. 125). It is generally agreed that unlike other Zang Fu pairs, the San Jiao is not a stand alone entity, but rather a pathway that connects and makes complete an organ system (Kaptchuk, p.68). The Thirty-first Difficulty says of the San Jiao: “It is responsible for intake but not for discharge.” and “It masters discharge but not intake, and it serves as a transmitter” (Unschuld, p.347). This refers to the San Jiao acting as a conduit for blood, qi and fluids that have been produced by the body and transforming and transporting them around the body to maintain communication and internal balance. Without the San Jiao pathway the warmth of Kidney Yang would not be available to aid Spleen Yang to warm, convert and transport blood, qi and fluids throughout the body. The San Jiao can also be thought of as three separate areas. Jiao means heat (Clavey,p.7) and so these three areas are often described as the three heaters or three burners. The Upper Burner is like a mist, receiving the fluids from below in the form of a fine vapour and trapping them and redistributing them out to the skin and sending the relatively turbid portion down to the Urinary Bladder for refinement. The Middle Burner is like a maceration chamber and the Lower Burner is like a ditch because the turbid portion of all separation processes are sent to the Lower Burner for either refinement or expulsion from the body (Maciocia, 1989, p.l 19). When the San Jiao is impaired the organs ability to communicate, nourish and support each other is also impaired. The lubrication of muscles, skin, orifices, joints and the functioning of all parts of the body suffer. When the San Jiao is impaired it is not only fluids but also qi that is impaired as qi also flows through the San Jiao. The “San Jiao is not only the pathway for Yang qi transport but also the route for the ascent and the descent of qi movement, controlling the qi transformation for the whole body, and indeed determining exactly where in the body the Yuan qi will be distributed” (Clavey,1995, p. 8). When the San Jiao is disrupted the qi and fluids of the body do not flow correctly and then the fluids gather and thicken forming damp and phlegm, leading to many symptoms such as edema, Spleen deficiency and damp related problems. In fact all facets of the body can be affected, including the Liver, which, because of its pair the Gall bladder, is in the same level of organisation as the San Jiao, the Shao Yang. The San Jiao is an organ without form but with a major role to play in the correct functioning of the body. By distributing the yuan qi of the Kidney it is able to supply warmth and qi to the body to enable transportation and transformation to take place. Through the process of transportation it is able to communicate with all organs of the body via the interrelationships established between organ systems, moving blood and fluids and nourishing and supporting the internal workings of the body. The San Jiao is a pathway, which provides communication, lubrication and transportation for the body. Clavey, S. (1995). Fluid Physiology and Pathology in Traditional Chinese Medicine,. Churchill Livingstone. Kaptchuk, T. (1983). The Web that has no Weaver. New York: Congdon & Weed, Inc. Maciocia, G. (1989). The Foundations of Chinese Medicine. London: Churchill Livingstone. Ni, M. (Ed). (1995). The Yellow Emperor’s Classic of Medicine. Boston: Shambhala Publications, Inc.
Sivin, N.(Ed.). (1987). Traditional Medicine in Contemporary China. Center for Chinese Studies: The University of Michigan. Unschuld, P.U.(Ed). (1986). Medicine in China. Nan-Ching. California: University of California Press.